Over the past couple years I have received many comments and e-mails from mothers asking for tips and tricks on keeping a clean and organized home without spending hours cleaning and organizing. While I have shared a few tips and tricks with you on this blog, I am currently testing out a new product that I am beyond exited about. I don't think I have ever been so stoked about a cleaning product. (Please tell me that I'm not the only Mom who gets excited over cleaning products!) But seriously, this product has been a HUGE time saver!!! The O-Duster is a robotic floor cleaner designed to save you time on cleaning so that you can spend more time on what is important. I think the best part about this product is that it is so easy to use that even my 3 year old can do it. Which, in turn, saves ME even more time!!! The O-Duster uses electrostatic cleaning pads that attach to a flexible base. You can then choose from two cleaning programs. The short program will run for 30 minutes while the longer program will run for 120 minutes. Once the O-Duster is finished cleaning just remove the cleaning pad (if necessary) and toss it in the trash. Simple to use. Only 3 steps and my 3 even my 3 year old can use it. Flexible base. Allows the product to clean deep in corners and against walls without denting or scratching the walls. Compact size. Allows the O-Duster to clean under sofas, beds, and other furniture. Cleaning Cloth. This thing is not only great at removing dust but it also collects pet fur! Auto-navigation. Can sense objects and walls and will change directions when they are detected. Honestly there is not much that I don't like about this product. The only issue that I have had is that it tends to get stuck under the corner of my couch. However, my kids think it's a game and actually fight over who gets to move it when it does get stuck. The amazing people over at O-Cedar would also like one of you to enjoy the great benefits of this product as well. 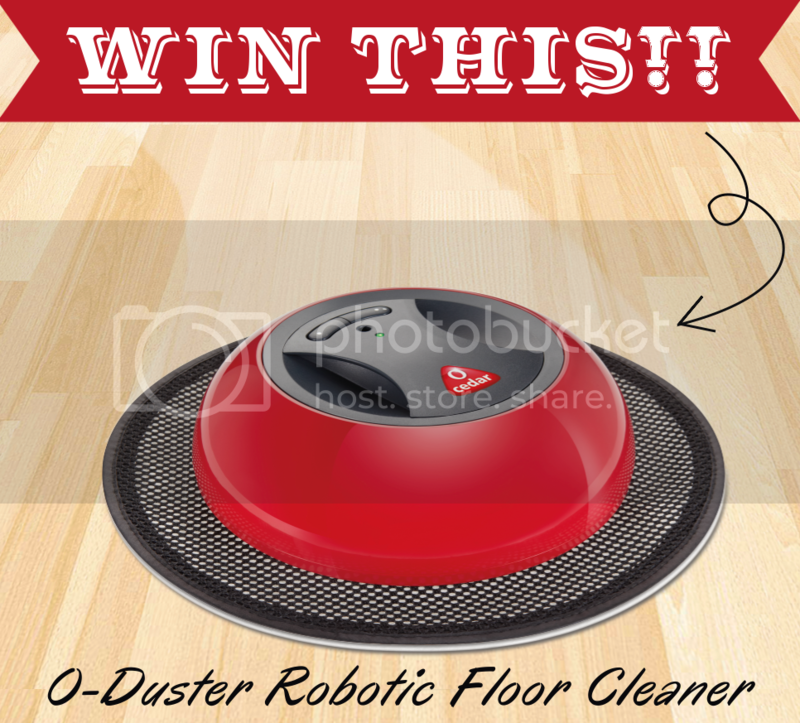 Giveaway is for one O-Duster Robotic Floor Cleaner. Giveaway is open from Wednesday, March 6th, through Tuesday, March 12th, and the winner will be announced right here on Wednesday, March 13th. 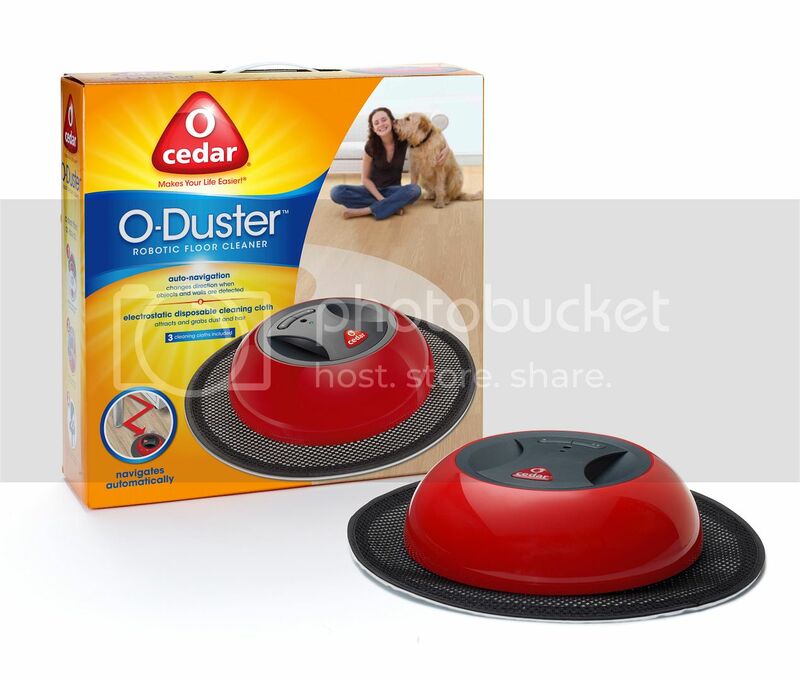 To learn more about the O-Duster and other O-Cedar products, like O-Cedar on Facebook or follow them on Pinterest. I wasn't paid or swayed to write this post, just offered an O-Duster in exchange for a review and giveaway. Wow, I spend 2.5 to 3 hours a week on my floors, with two dogs running around there is always dog hair. I've thought about something like this for years but always worried that the dog hair would clog it, I think with the pads it would work. Thanks. I have 4 small kids so I sweep and vacuum every single night! I must spend 2 to 3 hours every week. I would love this!! We live in the desert! There is always dust. I spend about a half hour every day dusting! Over several hours a week. I have 5 inside dogs and a cat, so the floors get really dirty! This would be so amazing for my house with two kids, a golden and a cat! Since I am a stay at home mom, It seem like that is all I do. ha.So I think it would be about 4 hours a week. I would guess about 3 hours a week. I sweep the kitchen everyday. I spend about 4 hours a week. Our yellow lab sheds, so, I'm always cleaning floors. got a black lab that sheds like crazy so about 8 1/2 hrs a week (twice a day at least)and all hardwood floors having 7 birds dont help either that enjoy spittin their food shells at the dog lol. I send about 45 minutes a week cleaning tile floors. Probably a half hour to an hour depending on how motivated I am for each room. Luckily, my sister vaccums her own room. Now cleaning the kitchen and bathroom floor...I don't really care for! We have a cat with long white fur he's constantly shedding so it seems as if I'm constantly sweeping and dusting and really don't have an idea of the time spent. I would love to win this, thank you for the opportunity! With 3 cats, 2 dogs, and 4 kids my floors need lots of attention often. I would guess 3 hours a week between vacuuming and mopping. I would love one of these!! I'm severely asthmatic and my floors need cleaning frequently. So I have to fight with my son with autism to do it, and he gets the main part of the floor but not the edges and under furniture without supervision, which takes more time. Probably about 6 hours just for floors, we have no carpet. One human, one Jack Russel. I spend about 100 minutes a week cleaning hardwood. Even if I don't win one of these O'Cedar O'Dusters, I going to buy one as soon as I find one! Since downsizing, having a grown daughter who is on her own, and becoming single, I spend much less time cleaning floors than I did in the earlier stages of my life. Now, it is my geriatric cat and me. A close estimate would be about 20-30 minutes weekly. A friend received a Rhoomba several years ago as a gift and I have coveted such a device ever since then. I would love to win this as we have 3 cats! I probably spend at least 3 hours a week cleaning floors. We have lots of wood floor space. I spend about 15-20 minutes most days going over them with one day weekly that I spend about 30-45 minutes. This would be great! Thanks for offering the giveaway. More time than I have - about two hours a week not including emergency touch ups which are done on an as needed basis. Thank you for the opportunity to win one of these gems. I spend about 45 minutes every week on my floors! I spent probably a couple of hours each week cleaning floors...if I do it! Not as much as I should with three cats. This would be perfect on my unsealed hardwood floors! I spend 2 hours a week cleaning my floors. No carpet at all in my house so I would say 2 to 3 hours a week. Thanks for the chance to win! I probably spend an hour a week vacuuming or dry/damp mopping my hardwood floors. Definitely not enough!! I spend about 40 minutes per day on my hardwood floors - but we don't have ANY carpet at all, so this would be perfect for us! It doesn't matter how much time I spend on my floors - it's never enough. They are always dirty...... 3 year old son, 5 year old son, 10 year old dog, husband and me.....always dirty! we decided to tile our livingroom,kitchen,diningroom,main hallway and quest bathroom...thought the carpet idea was holding too much dirt since we have ten active grandchildren....now that i am chair bound, my poor hubs has to do it everyday,,,plus its very cold,,i have put a oval rug in living room, but keeping the tile shining and dust free is an every day job..now that he has had heart surgery to replace a valve i feel that this new product would be a work safer for him. it would lighten his load at least an hour and a half per day!!!! I have wanted one of these robotic vacuum thingies for YEARS!! I have chronic pain and I have a hard time cleaning the floors some days. I have a 3100 square foot house so I need all the help I can get. Vacuuming everything can take up to an hour, and then mopping will take another two. So all together, 2-3 hours a couple times a week. This would be a life saver. Thank you! It only takes a few minutes to sweep for us so we spend about 15 minutes per week. I spend around 3 hours a week. Luckily, my house is small. We spend a few hours a week cleaning our floors. I SHOULD spend an hour or two a week. I DO spend zero to 15 minutes, with the occasional deep clean. I need this!! everyday with my 4 rescued cats and a Chihuahua I spend atleast 30 minutes cleaning a room. Ugh! Help please send to me!! Hello! I sweep what feels like every day! I'd say I spend about 70 minutes sweeping my house each week. This would make me and my doggies very happy home owners. PS, love your site! I just found it today while looking for O-Duster reviews. I'm sure to frequent here often. I should clean more often, but in reality I spend about an hour. Hardly any but it should be two or more hours a week! Right now is about 2 hours but when I get back in shape you can probably add abut 5 hours to that. I have only been doings weekly not daily at the moment. It will be nice to see if one of these things really works, I have always wondered. I am the type that will not buy a "gadget" like this unless somebody I know has one. I would have to say about 2-4 hrs depending on what happens daily. I have 4 lil people at home, a dog , and a husband. Not to memtion I scrub on my hands and kness. I dont feel its clean unless I do. At least an hour every week. When I mop, it's about 2 hours. Probably around 30 minutes a week. At least an hour a week - sometimes more. Thanks, doggies! With a family of four and a home for rescue dogs, I bet I spend about 10 - 12 hrs a week, sweeping, mopping, vacuuming, or shampooing carpets, or just spot cleans. There is always something to clean at our house. I could use something to help save time. With two kids under 3 and an inside dog I would estimate that I vaccuum at least 2 times a day for probably 45 each time! This would be a life saver!! !